In Australia, as elsewhere, retail markets for most illicit drugs including cannabis are often based upon friendships and occur in closed networks. Yet there is debate about whether ‘social supply’ should be limited to non-profit making by ‘friends’, and whether ‘minimally commercial supply’ is a more apt descriptor as many ‘social supply’ transactions often involve some small monetary or in-kind benefit. These definitional challenges are of interest in their own right, and also in considering whether and how, ‘social supply’ transactions could be treated differently in law. In this study, 200 Australian cannabis users aged 18-30 who were recruited from Melbourne, Perth and Armidale were interviewed face-to face, using a mixed quantitative and qualitative approach, to explore their experiences of accessing and providing cannabis. Most participants’ experiences of the cannabis market could be captured by the broad notion of ‘social supply’. However, definitional specificity was not aided by notions of friendship or profit. The findings have implications for the definition of ‘social supply’ and how low-level supply offences are addressed in law. Specifically, there may be merit in considering expanding current Australian drug diversion options, which typically include drug information and a brief intervention, beyond simple possession offences to include low-level supply of cannabis and other drugs, but it is unlikely a definition of ‘social supply’ could be applied in such regulations. 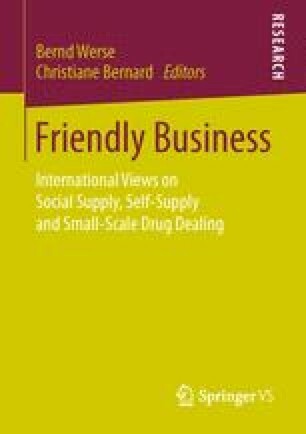 Coomber, R. & Moyle, L. (2014): Beyond drug dealing: Developing and extending the concept of ‘social supply’ of illicit drugs to ‘minimally commercial supply’. Drugs: Education, Prevention, and Policy, 21(2): 157-164. doi: 10.3109/09687637.2013.798265. EMCDDA ((undated)): Treatment as an alternative to prosecution or imprisonment for adults. Lisbon: EMCDDA. http://www.emcdda.europa.eu/html.cfm/index13223EN.html. (Accessed 06.07.2015). Harm Reduction International (2015): The Global State of harm reduction 2014. London: International Harm Reduction Association. www.ihra.net (Accessed 17.02.2015). Lenton, S., Grigg, J., Scott, J., Barratt, M. & Eleftheriadis, D. (2015): The social supply of cannabis among young people in Australia. Trends and Issues in Crime and Criminal Justice, 503. Available at: http://www.aic.gov.au/publications/current%20series/tandi/501-520/tandi503.html (Accessed 15.12.15). Martin, G., Copeland, J., Gates, P. & Gilmour, S. (2006): The Severity of Dependence Scale (SDS) in an adolescent population of cannabis users: Reliability, validity and diagnostic cut-off. Drug and Alcohol Dependence, 83(1): 90-93. http://dx.doi.org/10.1016/j.drugalcdep.2005.10.014 (Accessed 09.12.2015). Moyle, L., Coomber, R. & Lowther, J. (2013). Crushing a Walnut with a Sledge Hammer? Analysing the Penal Response to the Social Supply of Illicit Drugs. Social & Legal Studies, 22(4): 553-573. doi: 10.1177/0964663913487544 (Accessed 09.12.2015). The Center for Health and Justice at TASC (2013): No Entry: A National Survey of Criminal Justice Diversion Programs and Initiatives. Chicago: Author. www.centerforhealthandjustice.org (Accessed 06.07.2015).